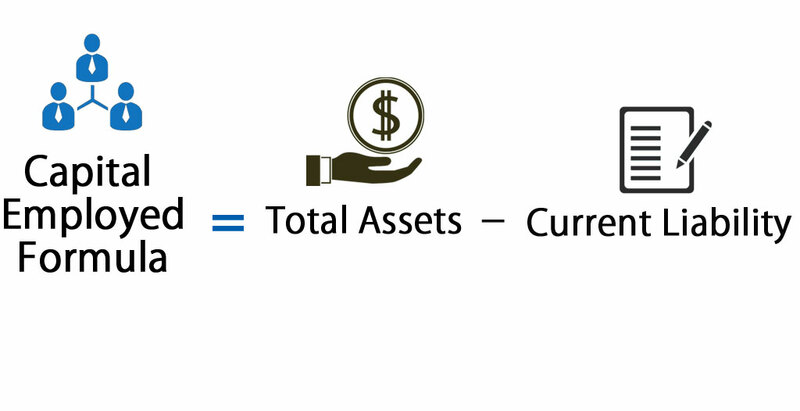 Total Assets: it is the total amount of assets owned by a business entity or an individual. Assets are items of economic value, which are expended over time to yield a benefit for the owner. If the assets are is a business, these assets are usually recorded in the accounting records and appear in the balance sheet as either current assets or long-term assets. Few categories in which assets can be classified are Cash, Marketable securities, Inventory, Accounts receivable, Prepaid expenses, Fixed assets, Intangible assets, etc. Current Liability: it is a company’s obligation that is due within a period of one year or in an operating cycle. Moreover, current liabilities are paid by using a current asset, such as cash, or by new current liability. Current liabilities appear on the company’s balance sheet and can be classified as short-term debt, accrued liabilities, accounts payable, etc. Non-Current Assets: it is the company’s long-term investments for which the total is not realized within an accounting year. Examples of noncurrent assets are plant & machinery, property, patents & investments in other companies, etc. Noncurrent assets appear in the company’s balance sheet. Working Capital: it is the difference between Current assets & current liabilities. It is used in the day-to-day operations and transactions of the company. All of the figures utilized for Capital Employed calculation can be found on the balance sheet of the company. Let’s suppose we want to calculate the amount of Capital employed by Anand in his business. We can get the required information in the balance sheet for calculating the capital. The balance sheet of Anand Group Private Limited states that it has Total Assets of $40,000,000 and Current Liabilities $15,000,000. Capital Employed = $40,000,000 – $15,000,000. i.e. Capital employed by Anand in his business is $25,000,000. 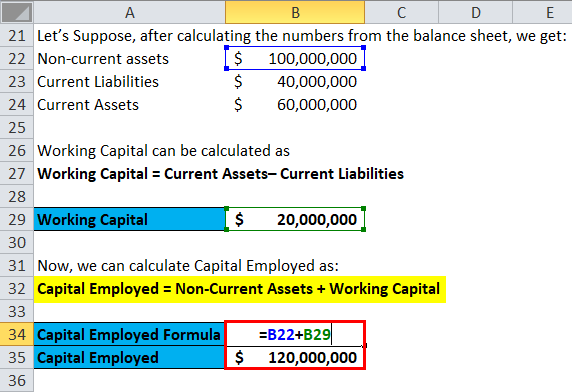 A capital Employed calculation in the second method, we need to calculate Non-Current assets and Current Liabilities and Current assets. The amount of Non- current assets and current assets are available in the Assets side of the balance sheet and current liabilities on the Liabilities side of the Balance Sheet. Capital Employed Formula is calculated to evaluate the total capital employed by the investors in any business for a realization of profits. It can be calculated in two as described above. However, the main idea remains the same, i.e., to evaluate the total capital employed by the investors in any business for a realization of profits. If the amount of capital employed is high and is not sourced from Equity shareholder’s, then it shows a higher level of risk. It shows an aggressive business expansion and growth plans. If the plan goes successfully then it may provide a higher return to the investors on their investment. Return on capital employed can be calculated by dividing net operating profit or (EBIT) with the amount of employed capital. We can also calculate ROCE by dividing (EBIT) earnings before interest & taxes with the difference between total assets & current liabilities. Capital Employed is used to determine the return on capital employed. Return on capital employed is a profitability ratio which is used by the investors to calculate the approximate value of return they will be receiving in the future. ROCE can be calculated by comparing the Net Operating profit to the capital employed, it gives the information to the investors that how much each dollar return he will be receiving for each dollar of capital employed. Return on Capital Employed (ROCE) can be calculated by dividing EBIT (Net Operating Profit) with Capital Employed, i.e., ROCE = EBIT / Capital Employed. ROCE is mostly preferred over a return of equity or return on assets as it takes long-term financing into consideration which gives overall performance or profitability of the company for a longer period of time. An investor usually goes for Return on Capital Employed (ROCE) for evaluating the company’s operational efficiency and analyzing the future growth in term of value. The main drawback of ROCE is that it measures return against the book value of assets in the business. As these are depreciated the ROCE will increase even though cash flow has remained the same. Thus, older businesses with depreciated assets will tend to have higher ROCE than newer, possibly better businesses. Here we will do the same example of the Capital Employed formula in Excel. It is very easy and simple. You need to provide the three inputs of Non-Current Assets, Current Liabilities, and Current Assets. 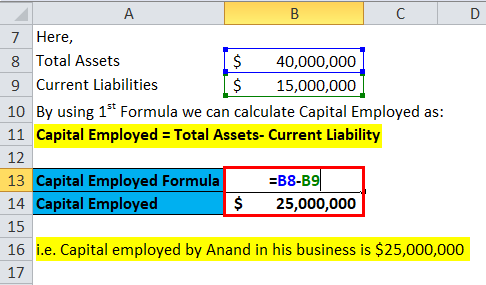 You can easily calculate the Capital Employed using Formula in the template provided.